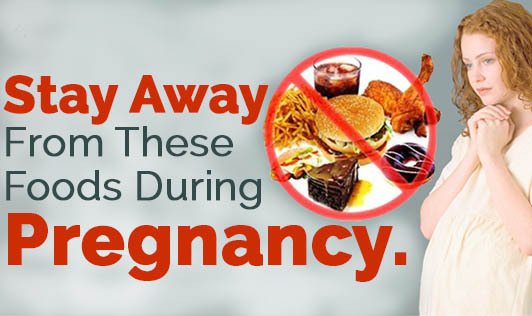 Stay Away From These Foods During Pregnancy. Eating nutritionally balanced foods during pregnancy is very essential. In India, dietary habits of pregnant women are highly influenced by food fads, cultural taboos, customs and religious beliefs. Another common belief is the concept of ‘hot foods' that produce heat in your body and ‘cold foods' that have a cooling effect on your body. Pregnant women in India are bombarded with so many advices and suggestions that they actually end up being confused about what to eat and what not to eat. Read through to understand and simplify it yourself. 1.Papaya: The forbidden fruit in India for pregnant women! Researches claim that consumption of ripe papayas does not pose any risk to pregnant mothers. Unripe and semi ripe papayas contain high concentrations of latex which is known to induce uterine contractions leading to labor and abortions. Even a small amount of the latex can affect the fetus if the mother is allergic or sensitive to it. 2.Egg Plant: It is stated in the book ‘The way of Ayurvedic Herbs' that eggplant is found to be helpful in treating amenorrhea and premenstrual syndrome. It has been proved that when eggplant is eaten daily, it stimulates the onset of menses that had been ceased. It is probably this property of eggplant that carries the doubt in pregnancy. However, consumption in small quantities is safe and does not have any ill effects. 3 Oil seeds: In traditional medicine, one table spoon of ground sesame or til seeds with jaggery, twice a day was used to abort an unwanted pregnancy. The effects are prominent in the early stages of pregnancy. Sesame seeds excite the uterine muscles causing contractions, and expels the fertilized ovum. Hence, it is advisable to avoid til seeds especially during the first trimester. 4.Raw Meat: Any sort of raw and under cooked meat should be avoided. It might carry the risk of being contaminated with coliform bacteria, toxoplasmosis and salmonella and thus leaving you and your baby infected. 5.Raw Eggs: Uncooked eggs and foods that contain raw eggs like mayonnaise, homemade ice cream or custards made with raw eggs should be avoided, to prevent any kind of infection and allergy. 6.Fish: Fish from contaminated rivers and lakes can be exposed to mercury and other industrial pollutants like polychlorinated biphenyls. Remember, this could be true in the case of fish bought from the streets and local markets, and not from authorized super markets that generally have graded fish and meat products. 7.Soft Cheese: Sometimes, cheese may contain bacteria called listeria that can cause miscarriage. Listeria is can enter the baby through the placenta and infect the blood causing serious life threatening circumstances. 9.Alcohol: There is no safe amount of alcohol during pregnancy and hence should be completely avoided. Alcohol consumption can lead to fetal developmental disorders. If you were consuming alcohol before you knew you were pregnant, it is better you stop immediately. 10.Unwashed Vegetables: it is safe to eat vegetables. But it has to be thoroughly washed before use, as they may be contaminated with toxoplasmosis. Also, washing eliminates harmful pesticides that may be present on these vegetables.